46 Seconds Per 100m Faster In 10 Weeks! 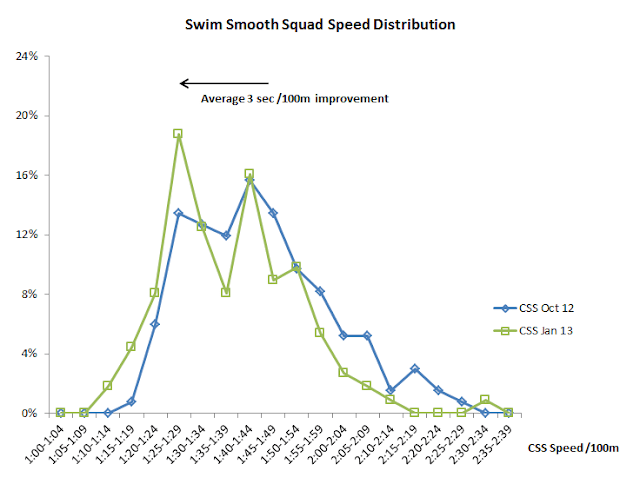 "Critical Swim Speed" (CSS) is the maximum speed you can swim for 1500m and we express it as a time per 100m. A good goal might be to improve your CSS speed by 3 or 4 seconds per 100m - if you do that with consistent CSS training sets you'll see some big improvements in your performances over any race distance. But what about taking 46 seconds per 100m off your CSS speed? 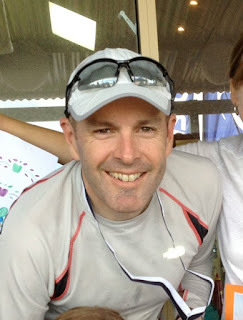 Gavin joined our Swim Smooth squads in Perth a few months ago and has done just that - a phenomenal improvement and the largest we've seen over such a short period of time, improving his CSS pace from 2:55 to 2:09 /100m. At the beginning of the 10 weeks, Gavin's 200m and 400m times were 4:55 and 10:45 /100m - a drop off in speed of 9.3%. As we discussed in our previous blog post here, such a drop off suggests he has a lot to gain from CSS training, which certainly turned out to be the case! A key distinction with our approach with Gavin was to have him tackle some structured training sets. Many swim coaches would say that a swimmer taking over 9 minutes for a 400m swim should only focus on stroke technique and not consider swim fitness at all. Unfortunately that can leave you on a plateau (sometimes literally for years) as you never gain the fitness you need to sustain a good stroke technique. In our approach we worked on improving Gavin's stroke technique but combined this with some structured sets at the right training pace for his level of swimming (his individual CSS pace). This helped him develop that 'swimming engine' that we all need and allowed him to progress so quickly. If you can swim 400m continuously then you're quite capable of tackling this sort of training yourself. Improving your swimming shouldn't take years, when you have the right approach it should happen really quite quickly. SS: Hi Gavin, what prompted you to start swimming seriously? - I needed to keep fit while recovering from a running injury, so that was the trigger. - I haven't been into aquatic sport before and this has always struck me as something I was missing. - I have two young daughters and wanted to set a good example to them for fitness, water safety and sticking at learning a new thing. - A friend of mine who knows me well thought I would enjoy it and thrive on it. The next question was where to go. I read somewhere that if you want to run faster you just need to run more but to swim better is as much brain as brawn. So I knew I needed help, and your program was recommended to me as a good way to start, by someone who had himself started as a self-confessed "muppet" in the water. SS: What were the first few sessions like? Tough! As a beginner I had no idea what to expect in a squad session, and even less idea what I was doing. You were encouraging in a relaxed sort of way, just saying "get in the water and give it your best". This was simultaneously re-assuring and daunting! However my fears of being belittled or embarrassed were unfounded - I remember you giving me a genuine "well done" on my first ever continuous 400m. Fortunately most of the drills are pretty straightforward and even a beginner can quickly master them to the point of concentrating on getting the technique 100% right. This makes someone like me feel like they are learning fast. However the stand-out feature of those early sessions was that the last 100m in the session was definitely easier than the first 100m in it. Gavin is this year's "biggest loser"
in the Swim Smooth squads! SS: What single technique tip has worked the most? Tricky question! My problem was body position in the water and we've done several things to fix that so its hard to pin down. However the one that was my biggest challenge and hence I think the biggest difference was simply to breathe! Coach Alan pulled me up one morning and said in his Glaswegian accent, "Are you holding your breath? I cannae see any bubbles". Focusing on breathing out has got my head down and my hips up, and everything flows on from there. SS: What is your prior swimming experience? Basically none. I could avoid drowning for some period of time. The last time I swam a lap of a pool would have been in secondary school, over 25 years ago! I've never been involved in a squad or had any coaching. Now I regret not doing it before! SS: How did you feel about a 46 sec /100m improvement in your CSS? I was blown away! I didn't think it was possible. I would have been delighted with half that improvement. I do qualify it a bit because it comes on a laughably slow base, but 2:09 /100m is a good pace in its own right and I am really proud. I also feel very grateful to you and all the coaches, also to my mates who have supported me with extra-curricular swims and encouragement. While you said it was down to my hard work and persistence, support and encouragement are food for those things and no way I could have done this in isolation, even with the techniques. Every year in the Swim Smooth squads we run our "biggest loser competition", normally over 10 weeks from October to January. Gavin's improvement was the biggest improvement we've ever seen in someone's CSS pace over such a short period - can you beat it? - A solid CSS training set once a week with an emphasis on good pacing throughout each set. - Technique based training sessions to maintain and develop their strokes, including some longer swims focusing on technique. - A weekly open water skills session (normally in the pool) which is a fun blend of drafting, sighting, turning and swimming quickly in disturbed water. Combining our "three keys" of Technique, Training and Open Water Skills in your year round training is the secret to improving your swimming and that's exactly how we developed the whole training squad here. It's not rocket science but it's almost guaranteed to improve your swimming. We are running one of our 3 Day Coach Education courses at Loughborough University on March 8-10th. If you would like to join us please apply here. We'll also be running a single swim clinic in Loughborough on Sunday March 10th. We know, only one, but that's all we have time for and it will fill up in a flash, so if you can make it, don't hesitate to purchase a place here. Demand is so high in the UK for our coaching services we can't possibly meet it by travelling over from Australia. That's why we hand picked the best coaches in the country and intensively trained them in Perth so they can offer you video analysis consultations and clinics year round. For more information see the column on the right or visit their homepage here. One thing we haven't done for a very long time is visit Ireland and we're overdue a trip to see you guys. If you're interested in attending a clinic either in the Dublin or Belfast areas in the first half of March then please email us at clinics@swimsmooth.com, let us know your phone number and which location you'd prefer. Unfortunately any clinics we run will have to be on a weekday so please take that into account. We'll also be at the The Triathlon Show (TCR) in March - come and see us again there. We'll remind you nearer the time but if you have footage of yourself then bring it on a memory stick to get our input on your stroke. When training for any swimming event you need to make sure the work you are doing in the pool is the right sort of training for the distance you are racing. If you are a triathlete, open water swimmer or pool-based distance swimmer, this means training your ability to hold a strong pace for a long time. 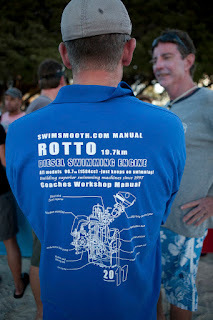 At Swim Smooth we call this "becoming a diesel engine". If you come from a gym or team sport background then you are likely to be quite fast twitch and anaerobic. You might hold a very fast pace for 50, 100 or 200m but then quickly drop off over longer distances. This is akin to a high revving petrol engine, which is great if you are racing over those shorter distances but far from ideal for 800, 1500 or 3800m events. Your genetics can bias you naturally towards distance events or shorter sprints but with the right sort of training you can shift your fitness in the direction you want to go and for most swimmers reading this blog, that means training to become more of a diesel engine. We'd all love to have the best of both worlds and be great sprinters and great distance swimmers too but that's not possible, otherwise the best sprinters in the world would also win the gold medals over distance events. We recommend CSS training as the mainstay of your fitness training to develop that diesel engine and become a great distance swimmer. You can find out more about training using CSS here, in our book (chapters 24 to 27) and follow CSS sessions in our waterproof training plans. Even if you consider yourself quite a slow swimmer this sort of training will be very beneficial to you as it's likely your diesel engine is underdeveloped and improving it is one of the keys to you becoming faster and feeling more relaxed in the water. When performing CSS sessions always bear in mind that pacing things out well is critical. If you start fast and then blow-up you're just training the petrol engine again! To check the drop off in your pace as distances get longer you can use the 200m and 400m timetrials from the CSS test. If you have a large drop off in speed during the 400m versus the 200m then this trend will continue and over longer races you'll be much slower again. - If you swim 8:10 for 400m and 3:50 for 200m, you slowed down by 6.5% over the 400m. This says you've got a lot to gain from CSS type training and it should be a real priority to improve your swimming. - If you swim 6:00 for 400m and 2:55 for 200m, you slowed down by 3% over the 400m. CSS training is still important to you but your diesel engine is coming on nicely - well done! If you can reduce that drop-off then you're almost guaranteed to be improve your CSS pace and be quicker over any distance swimming event. - Do the 400m first, it will affect the 200m less than the other way around. - Make sure you pace them out well, if you have a friend or coach to help then ask them to take your splits every 50m to check your pacing.